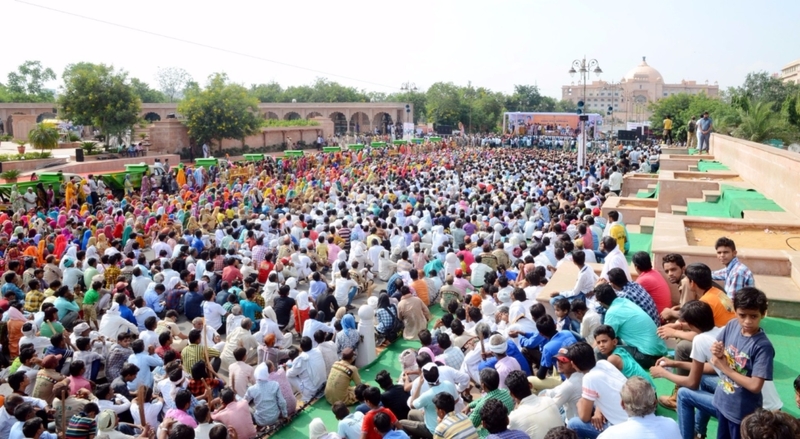 The Pink City Jaipur witnessed the historic campaign on cleanliness by Dera Sacha Sauda “Ho Prithwai Saaf, Mite Rog Abhishap”once again on Sunday (2 October). 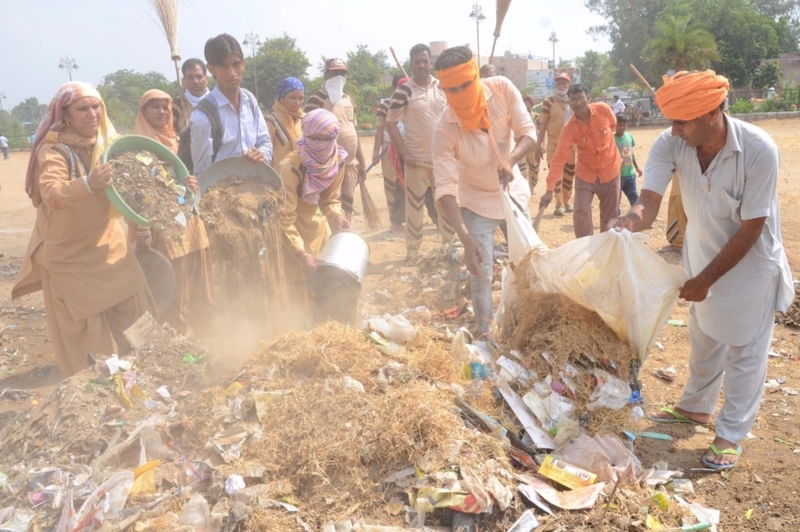 The key players of the event, organized near the Jaipur Vidhansabha, where the more than 50,000 odd followers of the Dera Sacha Sauda cleaned the whole city within hours (under the Safai Maha Abhiyan) and spread the message of cleanliness to the masses. 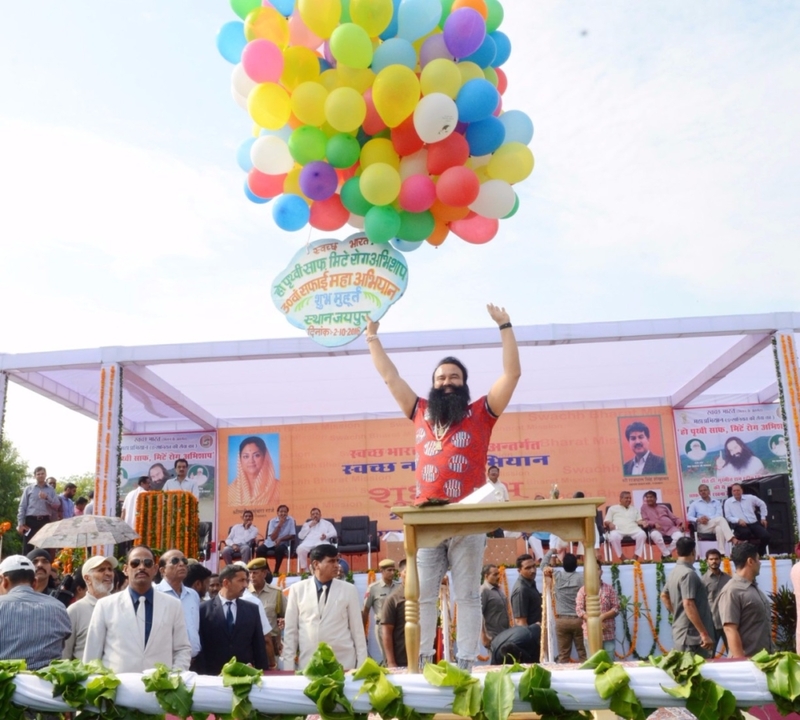 His Holiness Saint Dr. Gurmeet Ram Rahim Singh Ji Insan, the spiritual head of the sect inaugurated the function. Homeminster Shri. Gulab Chand Kataria, Autonomous bodies –Urban Development & Housing Minister Shri. Rajpal Shekhawat, President of State BJP unit Shri Ashok Parnami, Labour & Employment Minister Shri. Surender Pal Singh, Social Justice and Empowerment Minister Shri. Arun Chaturvedi, Minister for higher education Shri. Kalichran Saraf, Minister for water resources Dr. Rampratap, Shri. Mohan Lal (MLA), Mayor Nirmal Nahata, District head Shri. Mool Chand Meena, Shri. Surendra Pareek and Shri Sanjay Jain (Head BJP City unit) were present at the ceremony. The Chief Minister Smt. Vasundhara Raje could not attend due to ill health. Prior to this, Revered Guruji visited the Amar Jawan Jyoti and laid flower wreathes in memory of martyred soldiers. On reaching the venue of the inaugural ceremony, the Ministers and authorities welcomed Guruji with flower bouquets. Ms. Honeypreet Insan, daughter of Revered Guruji, also graced the event. After this, the dignitaries joined Guruji in wielding brooms and sweeping the premise to inaugurate the mega campaign. He then released balloons with slogans about the campaign written on it and requested all the volunteers to start the mega drive. Revered Guruji also showered blessings on those to made it all the way to join the campaign from far and near. 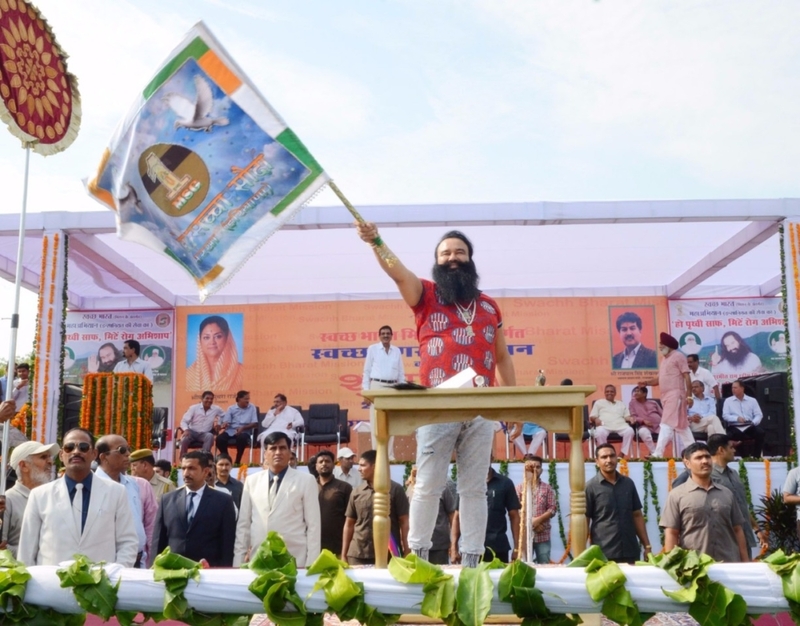 Revered Guruji thanked the State Government officials for allowing this cleanliness campaign in the capital city. He said that it was mandatory to seek permission before organizing such drives earlier. He congratulated the officials who themselves were a part of the cleanliness campaign this time and promoted it. He also said that if Prime Minister Narendra Modi asked him to clean the rivers Ganga and Yamuna, he would gladly take up the task of cleaning the rivers with his volunteers. He also mentioned that a few years back 15 lakh volunteers from across the world joined him to clean Ganga river by removing 20,000 metric ton of debris between Rishikesh to Roorkee. He proudly said that his volunteers could clean up the entire country in a month or two. The Mega cleanliness drives were initiated by him in 2011 in New Delhi and this was the 30th such mega campaign, the second in Jaipur. Revered Guruji expressed his happiness that Prime Minister Narendra Modi not only adopted the idea of cleanliness drive, but took awareness about cleanliness to the masses. The Homeminister Shri. Gulab Chand Kataria thanked Revered Guruji on behalf of the state of Rajasthan and the seven crore residents of the city of Jaipur. Shri. Rajpal Singh Shekhawat (Minister of Autonomous bodies and Urban Development) informed the gathering that a statewide call for cleanliness has been given by Smt. Vasundhara Raje Scindia and Shri. Narendra Modi, starting in Jaipur today . 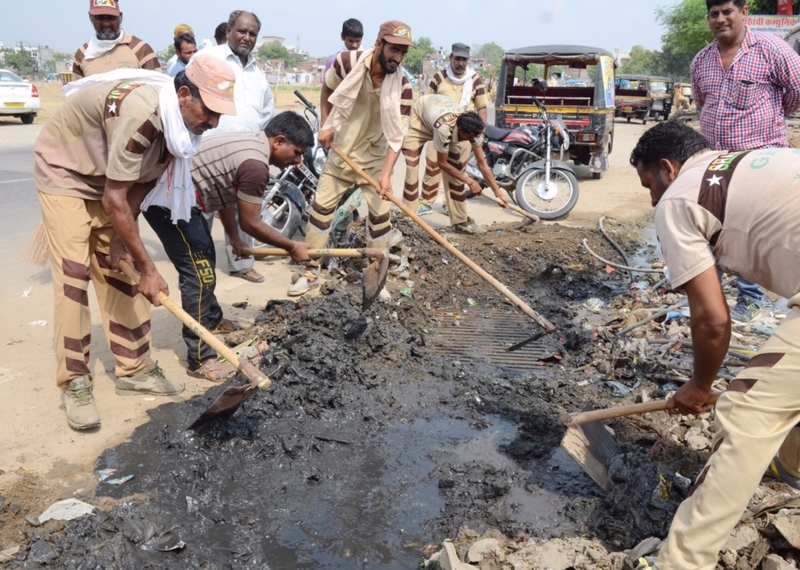 He praised Guruji and the volunteers of Dera Sacha Sauda who took up the cleanliness drives in major cities around the country. He urged the populace in Jaipur to take inspiration from them. The guests also flagged off 51 hopper vehicles that would remove the debris from the drive and also distribute the cloth bags launched by the city municipal corporation to the masses. This is the second mega cleanliness drive in the Pink City. Prior to this event, such an event was organized in the city on November 1, 2011 when around 3 lakh volunteers from around the country made the city debris free in mere 7 hrs and left the message of clean and disease free environment with the dwellers. 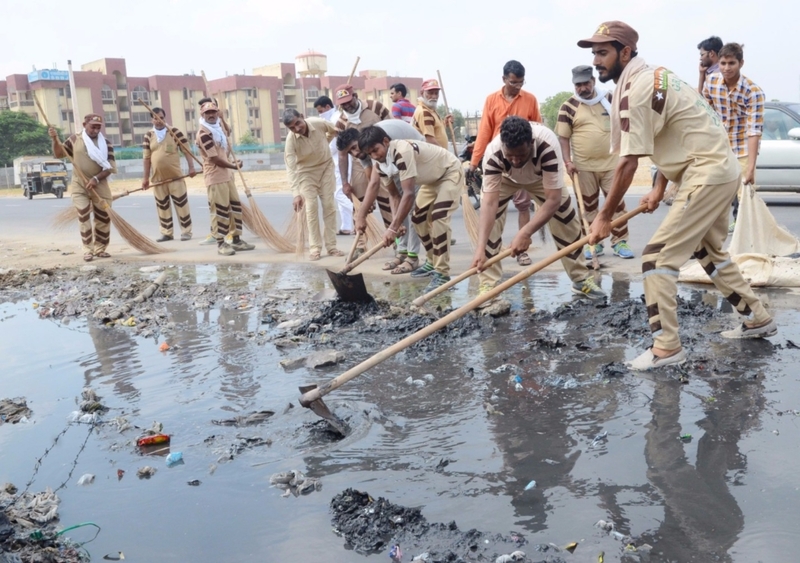 After 4 years and 11 months, on a call from Revered Guruji, the volunteers of Dera Sacha Sauda joined this mega drive in thousands, to make this capital city of the desert-state clean again. The 91 wards of the city of Jaipur were divided into 8 zones, where the volunteers were assigned task according to their cities and districts. The volunteered reached their designated zones, cleaned up the assigned area and left for home. They came in buses, cars and by train, carried their own, brooms and other paraphernalia for cleaning, along with food and water. On one call by their Guru ji, they came from far and near and cleaned up the entire city within hours. Where ever they went in the city, lanes and bylanes, were left debris-free after they left. Every one who witnessed was left speechless and wholeheartedly praised the unprecedented effort of the volunteers. Under the guidance of Guruji, Dera Sacha Sauda runs 126 welfare works. More than 6 crore followers of the sect whole-heartedly support blood donation, tree plantation, cleanliness drives and others. Revered Guruji has 56 world records to his credit because of these welfare works carried out under his directions. 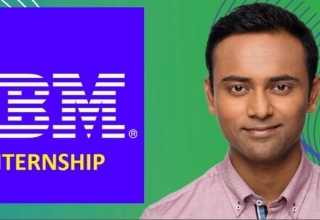 He is also a recipient of the 44th Giants International Award for Social work, conferred to him at the recently held Giants day and Award function in Mumbai, on September 17, 2016.